Sutton Coldfield’s Town Charter of 1528 put an end to the feudal system which had operated in the town for over half a century, and the dissolution of Canwell Priory shortly after released Hill and Little Sutton from their feudal obligations to the Prior. Some of the feudal customs continued, however - the Manorial Court still regulated the conduct of the Sutton folk and reinforced the ancient customs, and most of the population was still engaged in agriculture in the open fields. Little Sutton’s open field system, which had been in use for 600 years, consisted of three fields; there was Shadwell Field, between Grange Lane and Worcester Lane, Steynley Field extending from Grange Lane to half-way down Jordan Road, and Well Field to the south of Little Sutton Lane. In 1569 William Croxall was a tenant farmer of 19 acres in Little Sutton, having 37 separate half-acre strips of land, long and narrow, some in each of the three fields. He worked his land in common with his neighbours on the age-old rotational system. One feature of the open field was that there were no fences between the various strips, so that the communal plough could have easy access from one to another. But elsewhere in Sutton a different mode of agriculture had taken hold, where groups of strips had been consolidated into a square fields bounded by hedges which the farmer could cultivate with his own private plough or lay down for pasture. In 1569 there were one or two such “several” fields established in the Little Sutton fields by Croxall’s progressive neighbours. The open field system could hardly operate if some of the farmers opted out, and sometimes those who could not consolidate their strips took the law into their own hands and destroyed the hedges round the “several” plots. The Sutton manorial court issued an ordinance in 1547 that no-one should destroy his neighbours fences on pain of a 2d. fine; a number of fence-breakers were fined in 1561, and in 1562 the fine was increased to 12d. (5p). Two hundred years later, in 1759, details of another farm in Little Sutton were recorded when it was sold to William Rochford. The 33-acre farm consisted mainly of eleven small fields of two or three acres, so the old method of strips in the open fields was no more. However, the farm was not a compact unit, as the fields lay in each of the three ancient open fields - eleven acres in Shadwell Field, a fair distance along Worcester Lane, eight acres in Steneley Field near Tower Road, and eleven acres in Well Field just south of the Fox and Dogs; having land in each of the fields reflects the farm’s medieval origin. The exact location of the fields is hard to determine - all the fields are named, for example “Hollytree Leasow” and “Well Croft”, but these names do not appear on the 1824 survey. Only Roughley Croft, of three acres, was not former open field land, having been taken in from the commons since 1569 - it lay even further away from the village, to the north of Duttons Lane. There were three pieces, each of one acre, which were reminders of the old land-holding pattern - for example “ The Northern half of Smaalwood’s Nook - 1 acre - divided by a furrow from land…occupied by Joseph Bampton and used in common”. All except this land except the northern part of Shadwell Field is now built over. 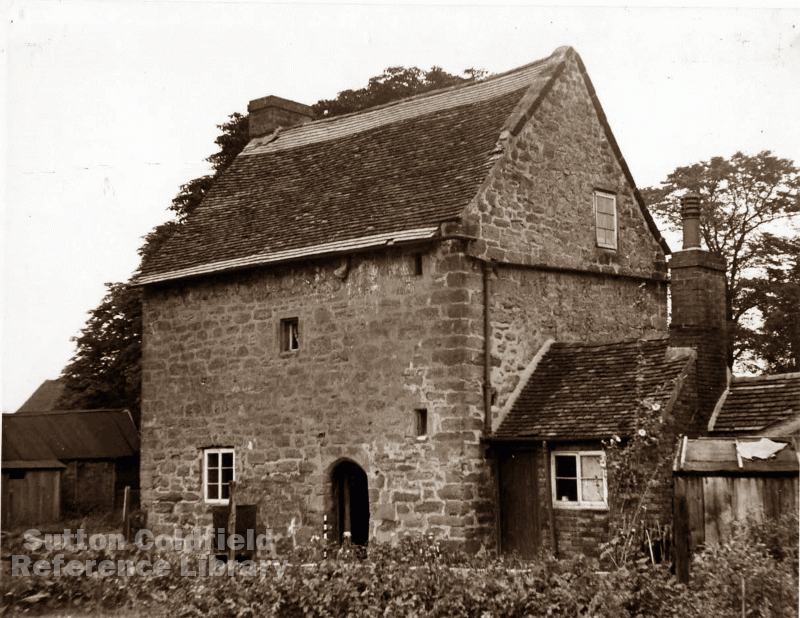 This 16th century stone house in Little Sutton survived until the 1950s. (photo courtesy of Sutton Reference Library).